I would choose engineered stone any day over Corian. 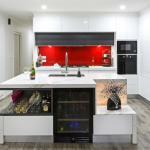 Stone Benchtops - Possible for supply only? Swap fridge amd pantry around? Is too much beige barely enough? To suggest colours it might be best if you could post a photo. PS take a look at your taps as well if they old maybe replace them. IKEA oven cabinet owners - which oven did you get? We managed to lift the bench tops off with only 2 people!! Thanks for the help. Thanks. The chipping is on the melamine board so looks like it is what u say... A badly setup saw. Adding kitchen pantry after handover - How do I do it? kickboard removal for floating floor, is it worth it? what about Goldline products. they are designed for high power wok and oil cooking, australian made too i think. We have one. You can get cabinets in any depth you like. Just go to a cabinet maker. how hard is it to install drawers and how does it work? Benches under "low windows" - renovation hopes shattered? My stone mason told me that square edge will have very sharp edges and can get chipped. so go for pencil round. Anything can install on Canopy chimney to block out flies??? How can I find out what this floor is?! They ARE tiles!!! Can I use this for my kitchen cabinetry??? Kitchen cabinet colour - help please! Anyone heard of/seen CaesarStone Concetto? Solid timber kitchen cabinets with plywood carcasses? If money was no object...what is the BEST benchtop?? Kitchen cabinets with a silhouette/pattern?? Hi Adam, have a look at this website through laminex, it might be able to help. Thanks guys. After looking at my walls again they're a bit more yellow than I had imagined. I passed by the showroom this morning and now I'm leaning towards Cashmere. Custom-designed and -built kitchens with a 3D virtual tour so you really know yo uare getting the kitchen you want!